Hello everyone! I am back with another recipe for you guys. Something that I absolutely love are lettuce cups. Iceberg lettuce is crunchy, flavorful, and perfect for little cups to add an array of toppings to. 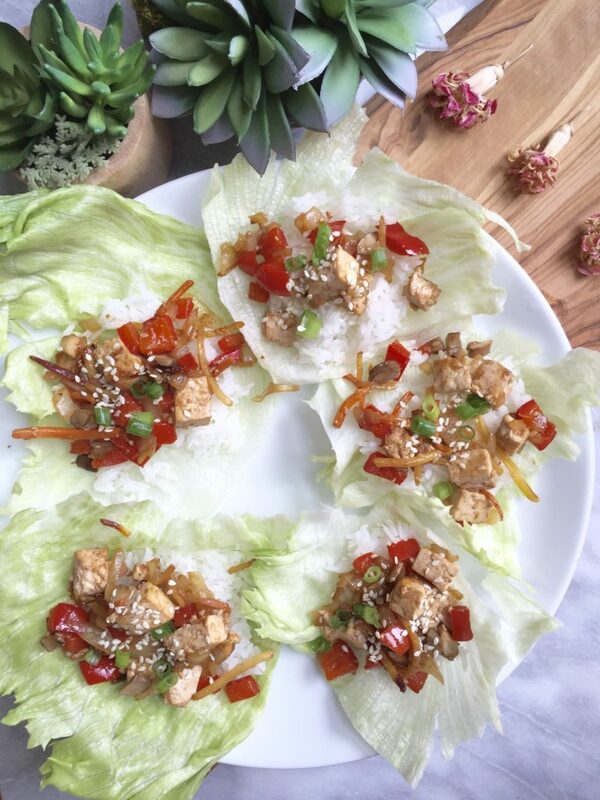 As a kid I was never able to eat lettuce cups because usually they were all made with peanut butter, or some type of nut (allergic). So I decided to make one that was nut allergy friendly but still had amazing flavor. Usually lettuce ups don’t come with rice , but I like them for added carbohydrates and to make them more filling. Cook rice according to package (I use frozen from Whole Foods which takes about 2 minutes – I highly recommend). Heat pan on medium high and add water or non stick oil spray and allow to heat. Add peppers & onions and stir until fragrant and onions are translucent. – About 3-4 minutes. Add in mushrooms & carrot and stir until mushrooms have cooked down – Then add garlic powder, salt & pepper. Meanwhile in a small bowl combine your soy sauce, sesame oil & corn starch, mix to combine, and immediately add to stir fry. Cook for another remaining 2 minutes. Evenly layer rice on each lettuce cup then top with stir fry. Sprinkle green onions on top & even sesame seeds for added flavor. I hope your enjoy this recipe! It truly is so easy to make and is so delicious! Veganism is so simple but satisfying and that is what my blog is meant to show.